What does the now sustained recovery in the UK and the still tentative signs of recovery in the Eurozone tell us? 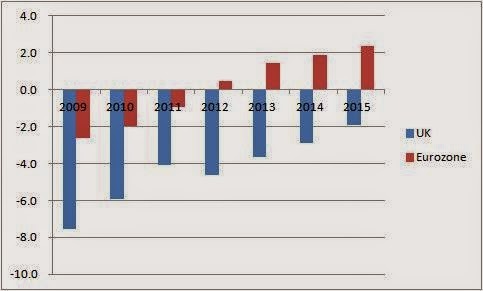 According to some on the right, it says all is good in the world, austerity has been successful and we need to stay the course. According to some on the left, the recovery is not real, and anyway it is all because there are more people, or because of a house price bubble. First austerity. 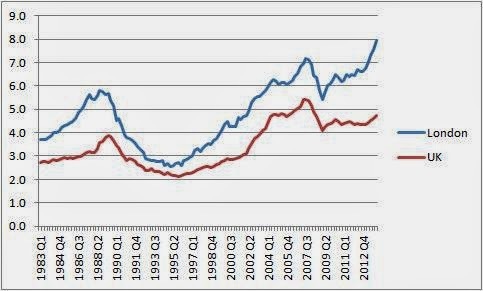 As I have said many times, the current recovery tells us nothing about austerity. In the UK austerity helped delay the recovery by three years. We can argue about how much of the stagnation of 2011 and 2012 was due to UK austerity and how much to the Eurozone (austerity somewhere else), but no serious economist would argue with the statement that both played a significant part in delaying the recovery. That is why I wrote this over a year ago. In the Eurozone austerity helped create a second recession. Here we can argue about the relative contributions of fiscal policy and inept monetary policy, but again no serious economist would disagree that austerity played a major role. Model based estimates suggest Eurozone GDP was around 4% lower in 2013 as a result of fiscal consolidation, and this restrictive fiscal policy was not confined to the periphery. In the UK austerity was put on hold in 2012 and 2013, which helped allow the recovery in 2013 (see my April Fools day post or this from Jonathan Portes). However suspending austerity did not create the recovery, which was mainly down to lower consumer saving. This reduction in saving may have happened anyway, but both Funding for Lending and Help to Buy will have lent a helping hand. In the Eurozone austerity has continued. That will be a drag on growth, but it alone is not enough to prevent a recovery as consumers rebalance and monetary conditions in periphery countries ease a little. What about the counter argument that the recovery is not real, or not sustainable. In some ways this rhetoric is worse than the ‘austerity works’ line: it is also wrong, but it is much less likely to succeed as rhetoric. The fact that growth in output per person (GDP per capita) is less impressive that GDP growth alone does not detract from the recovery because, in a demand led recession, population growth does not automatically cause GDP growth. Recoveries are often led by consumers, but as long as investment follows on and average incomes begin to rise then a recovery will become sustainable. The rhetoric will not work because, despite the unequal and uneven nature of the recovery, many people do feel more optimistic now than two years ago. It is much better for critics of the government to focus on the ‘wasted years’ of 2010-2012, and on the fall in median incomes (pdf) over the last five years. If they want economic issues for today and tomorrow, focus on inequality. Does this mean that the macroeconomic debate (as opposed to the political debate) over fiscal policy is over? Here we should go back to basics. Tightening fiscal policy reduces output, and fiscal stimulus increases output, when interest rates are at their zero lower bound. So until interest rates start rising, austerity will still be a drag on growth. 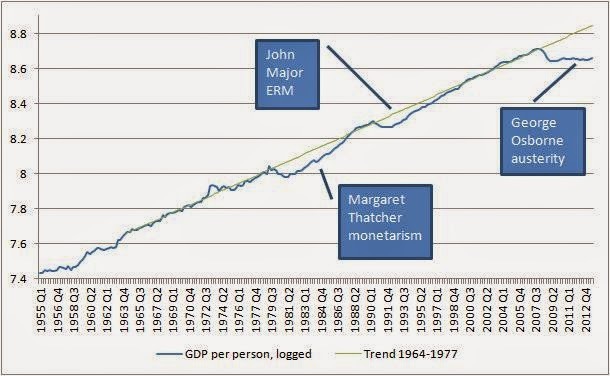 The macroeconomics says recovery could be quicker without austerity. But from a practical policy point of view, the influence of this basic logic on what politicians do seems as remote as ever. So for me the interesting question on austerity has changed. Although it is occasionally necessary to go over the macroeconomic logic yet again to counter the rhetoric I discuss above, what I find more interesting is why policymakers did the wrong thing from 2010 onwards, and what lessons for the future that implies. Was it all an unfortunate consequence of Greek profligacy? Is it down to the influence of the financial sector, and is this a result of mistaken beliefs or vested interests? How do we avoid this happening again? One obvious answer is that we must start the next liquidity trap recession with lower levels of public debt. But even if we did, is that going to stop those ‘close to the markets’ insisting on the dangers of the large deficits and rising debt that are the inevitable result of a recession, and then go on to insist that we need fiscal contraction to avoid a funding crisis? If the answer is no, how can we immunise politicians from such calls? Of course, just because the recovery and its development tells us little useful about austerity does not mean it is uninteresting - at least for a macroeconomist. For me a really big question for the next year or two is what will happen to inflation, particularly in the US and UK. This has not always been the case. From the start of the recession until recently consumer price inflation has been a misleading distraction. One of the clear lessons from recent history is that a focus on consumer price inflation when there are various temporary supply side shocks is dangerous. It led the ECB to raise rates just before a recession, and it almost led to higher rates in the UK. Monetary policy makers really should reflect on why they were distracted in this way. In the absence of similar distractions in the future, inflation should become a better indicator of just how fast the recovery could potentially be - of how much spare capacity there is available. Yet the exact relationship between this spare capacity and inflation remains mysterious. Most theories say that inflation should remain below target if the economy is below trend, but should inflation be rising or falling? There are some (old and new) theories that suggest that inflation could become disinflation even though the economy is growing reasonably well. Given this uncertainty, for a macroeconomist what happens to inflation over the next year or two will be really interesting. To sum up, the recovery is welcome: it is not an illusion, but neither does it atone for the sins of the past. Above all else, it must not lead to complacency. We have still a long way to go to repair all the damage caused by the recession. Even when that has been done, the problems that led to the financial crisis have not been fixed. With inflation targets still at 2%, and perverse fiscal responses, we remain dangerously vulnerable to any future large negative demand shock. Thank you for sending your paper ‘National Debt in a Neoclassical Growth Model’ to the American Economic Review. The paper has now been read by two referees, and I’m afraid the news is not good. Referee A raises a fundamental objection. Your model has a two period structure, where agents work in the first period but do not work in the second. This assumption is simply stated in one paragraph on your page 2, but is not justified in any way. In that sense it appears entirely ad hoc. Furthermore, as referee A stresses, it appears to contradict (is internally inconsistent with) another fundamental part of you model, which is that agents attempt to smooth consumption over time. The referee is quite happy with that assumption, as it clearly comes from standard postulates about the utility of the consumption of goods. Yet why should these postulates not also apply to the consumption of leisure? As the referee points out, if agents tried to smooth leisure in the same way as they smoothed consumption, there would not be any ‘retirement’. As this concern strikes at the heart of your model, it is troubling. Referee B raised rather different issues. They pointed out that the model implies a constant interest rate that is only a function of the population growth rate. The model therefore makes a clear prediction, but as the referee points out interest rates have fallen in this country over the last two decades, without any matching declines in the population growth rate. So the model has been clearly falsified by events, and therefore cannot be the basis of any meaningful discussion of the impact of national debt. The referee is also concerned that you failed to locate your analysis within an ontological discussion of the open rather than closed nature of the social realm, which makes your deductivist and formalist reasoning about socially constructed variables problematic, to say the least. I am therefore very sorry to inform you that we will be unable to publish your paper. Referee A did make a number of helpful suggestions about how ‘retirement’ could be microfounded, and I am sure you will find the extensive reading list referee B provided on economic methodology helpful in any future work. I read the Manchester Post-Crash Economics Society’s (PCES) critique of economics education in the UK with a bewildering mixture of emotions. (Claire Jones has a short FT summary here.) It is eloquently and intelligently written, but I believe in some respects fundamentally misguided. It is indicative of a failure of mainstream economics education, but not (as it thinks) a failure of mainstream economics. Yet even after all these years, it is a position I can empathise with. At its heart the critique is an appeal for plurality in economics. Rather than pretend that there is one right way to do economics (what the critique calls neoclassical), the critique says we should recognise that there are many alternative perspectives which have significant worth (and which therefore undergraduates should have significant exposure to). These alternative perspectives have become marginalised within economics over the last few decades, and the critique suggests that the financial crisis is evidence that this process should be reversed. This is not an unusual complaint, and I hear it frequently from those working in other social sciences. Let me first say what I agree with here. Students should certainly be shown something of heterodox (non-mainstream) thought. I’d like to think that if we taught economics to undergraduates as a more problem solving discipline, with less emphasis on its axiomatic/deductive structure, that would become easier. We should certainly get more economic history in there, and again that would be easier with a problem solving approach. What I disagree with strongly is that the current dominance of mainstream economics should be reversed, and that we should go back to ‘schools of thought’ economics. There are three reasons for this. ● Of course mainstream theory can be conservative. It has been used by some to support a particular ideology. I complain a lot about both. But the most important reason mainstream economics has become dominant is not because of these things, but because it has proved far more useful than all of its heterodox alternatives put together. I agree with Roger Farmer here: economics is a science. Its response to data and events may be slow compared to the normal sciences, for obvious reasons, but it is progressive. I cannot see any fundamental barriers to its continuing development. ● This is because mainstream economics can be remarkably flexible. One of the sad things about the way economics is often taught is that students do not see much of the interesting stuff that is going on in both micro and macro, and instead just learn what the discipline looked like 50 years ago. Let me give one example. Students get taught that under perfect competition the wage is equal to the marginal product of labour. If that was all there was to say, then you might indeed believe that economics was just a means of excusing current levels of executive pay or arguing against the minimum wage. But instead it is just the start of what economics has to say. Read Alan Manning, who argues that because firms generally set wages and changing jobs is costly, monopsony is the more relevant default model. Read the Piketty et al paper I referenced here which talks about rent seeking by executives, and how cutting top rates of tax encouraged this rent seeking. These are powerful and effective critiques of marginal productivity theory. ● At first reading, heterodox writers can seem like a breath of fresh air, because they are more holistic and often less formalist. But while many complain, with some justice, that mainstream economics can be resistant of radical ideas, I have personally found at least as much intolerance on the other side. Some heterodox economists appear to reject almost everything that is mainstream, which is frankly just silly. I think there may be a particular problem for students who are exercised by what they see as economic injustices around them. Economics in its studied neutrality can appear indifferent to that. It is natural for those who take an anti-establishment, left wing view to react to this perceived indifference by asking for revolution rather than evolution, by looking for a new paradigm. Perhaps those on the right, who may be happier with the status quo, find it easier to work within the mainstream, and use it to their own advantage. Yet any discipline where a utilitarian view is routine, and where diminishing marginal utility is standard, can hardly be described as inherently biased towards the status quo. I think it is true that economics as a discipline has tried too hard to emphasise that it is an objective, politically neutral discipline, thereby underplaying value judgements when it makes them. Worse still, sometimes heavily value laden ideas like the importance of Pareto optimality are portrayed as being value neutral, which is clearly nonsense (see above). Yet the idea that it should be possible to build a science of human behaviour which is independent of ideology or politics is a noble ideal, and one which has been partly achieved. We may need (and are getting) more political economy, in the sense of recognising that economics works alongside and interacts with social and political forces, but I do not think we need more partisan economics. None of this implies that there are not large gaps in the discipline, large elements that will not stand the test of time, and that there is much still to be done. But I agree with Diane Coyle (about economics, if not DSGE) that “the Naked Emperor needs to be reclothed rather than dethroned”. New ideas could perhaps come from heterodox thought, although I suspect that they are more likely to come from other social science disciplines. But they will be developed within the mainstream, leading to the evolution of mainstream thought. If students want to change the world, I think they are much more likely to do this by working within mainstream economics than heterodox thought. I have periodically argued for wage inflation targets in the case of the UK, but both their and my arguments are universal. My own argument for targeting wage inflation has been a combination of theory and practicality. As I have often pointed out, there are good theoretical arguments for targeting alternative measures of inflation besides consumer prices. The way macroeconomists usually measure the cost of inflation nowadays is to score the distortion to relative prices created by the combination of general inflation and the fact that different prices are set at different times. The ‘ideal’ price index to target would be one that gave a higher weight to prices that changed infrequently, and a low weight to those that were changed often. Wages are just another price in this context, and they are changed infrequently. The practical argument is that if we had been targeting wage inflation over the last few years, monetary policy would have worried less about the temporary inflation induced by shocks such as commodity price increases or sales taxes. Here is a chart of recent and expected wage inflation (compensation per employee) from the OECD. In normal times we would expect 2% price inflation to be associated with something like 4% wage inflation because of productivity growth. Wage inflation has not come close to that number in recent years in the UK, US or the Eurozone. It is difficult to see how the ECB could have raised interest rates in 2011 - as they did - if they had had wage inflation as an intermediate target. To paraphrase, unemployment (or anything similar) can become distorted as a measure of labour market slack, but wage inflation is a good indicator of the true state of the labour market. I would add one final point. The spectre that seems to haunt central bankers is the inflation of the 1970s. That has to be avoided at all costs. Yet the 1970s was associated with what was called a wage-price spiral: both price inflation and wage inflation rising rapidly, and a feeling that this was a contest between workers and firms that neither could win, but where society was a loser. If we want to avoid a wage-price spiral happening again, it is only logical that we look at wages as well as prices. There are probably a number of reasons why bank leverage (the amount of lending banks do in proportion to their capital) increased rapidly in the 00s: reduced regulation, underestimation of systemic risk as a result of the Great Moderation, a search for yield when interest rates were low, simple greed. Bank profits rose, and so did the incomes of those working for them. However the consequence of excessive leverage was inevitable: a major global financial crisis. Banks had to be bailed out using public funds. This produced a large negative demand shock which monetary policy was not able to counteract, because nominal interest rates fell to zero. In the US and UK governments undertook substantial fiscal stimulus to dampen the recession, but this, the recession and bank bailouts raised levels of public debt. As Reinhart and Rogoff show, credit booms and bust generally lead to public debt crises. In recent research Alan Taylor and co-authors go further. They show that recessions are deeper and more prolonged if they are accompanied by a financial crisis, they are deeper and longer still if that financial crisis is preceded by a credit boom, and finally “the path of recovery is worse still when a credit-fueled crisis coincides with elevated public debt levels”. Yet we need to be careful to avoid seeing some kind of inevitability here. For a start, following this recession there was no public debt crisis outside of the Eurozone. There was widespread concern about debt, which led to fiscal contraction, but no crisis. Prompt action that avoided a crisis, some would say. But we should be suspicious here. As Paul Krugman notes, this concern about debt was largely down to “the influence of the Very Serious People, whose views on economics tend in turn to be driven largely by the financial industry”. This financial industry got some of its economics seriously wrong, as Krugman notes here. I’ve also suggested that there may be self interest at play: finance needed to change the story from bank regulation. Even more cynically big banks needed lower debt levels to make their next bailout credible, so it could carry on enjoying high wages via an implicit subsidy. So, outside the Eurozone, was concern about debt real, imagined or manufactured? In the Eurozone there was a debt crisis. Everyone agrees the Greek government had overspent. But this crisis could have been resolved fairly quickly, if the Greek government had immediately defaulted on its debt, and the ECB had offered unlimited support for other solvent governments. However Greek default would have led to large losses for European banks, and possibly created a second financial crisis. As a result, default was initially resisted in Greece (to allow banks time to minimise the damage) and avoided elsewhere, and instead draconian austerity policies were imposed in the Eurozone periphery. Furthermore we know the political influence of the banks is huge: here I talk about the US and UK, but it seems unlikely that this does not also apply to the Eurozone. So in the Eurozone we had a second recession, which was the direct result of austerity. Eventually the ECB agreed to (in principle) provide unlimited support to solvent Eurozone governments, but not before austerity had been hardwired in the form of a new fiscal compact. Changes in bank regulation have fallen far short of what is required to avoid another crisis, as banks warned that increasing regulation would restrict their ability to lend, and therefore prolong the recession. The earnings of bank employees quickly recovered and resumed their rapid rise (see here, or here). Rather than seeing the financial crisis and austerity as two essentially separate stories, the needs and influence of the banks connect the two. Now there are many things missing from this story that I am sure are important, such as opportunism from those who wanted a smaller state. However one rather neat feature of this account is that it requires very few ‘exogenous shocks’. Indeed you could even argue that something like Greece was bound to happen somewhere, and so even this was endogenous to the story. As Mark Blyth writes, “what starts with the banks ends with the banks”. We are all used to seeing graphs of house price to income ratios. 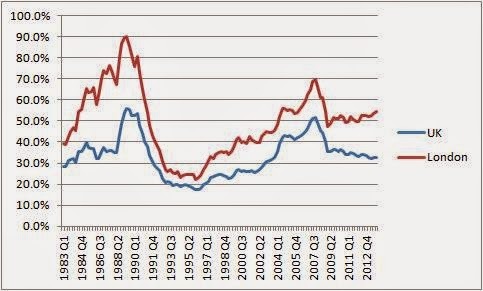 Here is Nationwide’s first time buyer house price to earnings ratio for the UK and London. Housing is becoming more and more unaffordable for first time buyers. Yet prices are currently booming (at least in London), and demand is so high estate agents are apparently now holding mass viewings to cope. In the UK the media now routinely call this a bubble, and the term ‘super bubble’ is now being used. London may be a bit unusual (see this extraordinary research), but it can also be a leading indicator for UK prices in general. Bubbles are where prices move further and further away from their fundamental value, simply because everyone expects prices to continue to rise. One of the earliest and most famous bubbles involved tulip bulbs in the Netherlands in 1637. Yet that bubble lasted less than a year. The dot-com bubble lasted two or three years. If you think there should be some underlying constant value for the house price to income ratio, then this UK housing bubble has been going on for much longer than that. Instead of being pricked by the 2009 recession, it merely seems to have paused for breath. If we think of housing as an asset, then the total return to this asset if you held it forever is the weighted sum of all future rents, where you value rents today more than rents in the future. Economists call this the discounted sum of rents. (If you are a homeowner, it is the rent that you are avoiding paying.) So why would house prices go up, if rents were roughly constant and were expected to remain so? The answer is that prices would go up if the rate at which you discounted the future fell. The relevant discount rate here is the real interest rate on alternative assets. That interest rate has indeed fallen over much the same time period as house prices have increased, as Chapter 3 of the IMF’s World Economic Outlook for March 2014 documents. Think of it this way. You believe that the return you get from owning a house (the rent you get or save paying) will be roughly constant in real terms. However the return you get on other assets, measured by the real interest rate, is falling. So housing becomes more attractive as an asset. So more people buy houses, and arbitrage will mean its price will rise until the rate of return on housing assets adjusts down towards the lower rate of return on other assets. As Steve Nickell pointed out in 2004, if the expected risk free real interest rate permanently fell from, say, 4% to 2%, this could raise real house prices by 67%. It is the expected return on other assets that matters here. The fact that actual real interest rates have fallen in the past would not matter much if they were expected to recover quickly. A key idea behind today’s discussion of secular stagnation is that real interest rates might stay pretty low for a long period of time. That in turn implies that house prices will be much higher relative to incomes than they were when real interest rates were higher. So what appears to be a bubble may instead be a symptom of secular stagnation. We can make the same point by looking at another measure of affordability, again provided by Nationwide. First time buyers are able to afford elevated house prices, because interest rates on mortgages are so low. Of course raising the deposit is a problem, but the government’s Help to Buy scheme has come to the rescue by effectively restoring the 95% mortgage that disappeared in the recession. Does this mean we should stop calling what is happening in the UK a bubble? The first point is that secular stagnation is just an idea, and it may prove wrong, and if it does house prices may come tumbling down. Second, even if it is not wrong, it is still possible to have a bubble on top of the increase implied by lower interest rates. Indeed one of the concerns about the lower real interest rates associated with secular stagnation is that, by raising asset prices not just in housing but elsewhere, it may encourage bubbles to develop on top. So all we can say with certainty, for the UK at least, is that the Financial Policy Committee will have their work cut out when they next meet in June. I recently wrote a post on the Eggertsson and Mehrotra paper on secular stagnation, because I thought the paper was interesting. A much more critical post from Unlearning Economics (UE) has just appeared in Pieria. UE says it “helps to illustrate the troubles faced by contemporary macroeconomics”. One of UE’s complaints seems to reflect a misunderstanding, often shared by non-economists, about what much academic macromodelling is designed to do. UE objects to the fact that the model assumes that the amount the young can borrow (the degree of leverage) is exogenous, which means that there is no attempt to explain where this constraint on the borrowing of the young comes from. UE also complains that the model contains no banks, and no investment in physical capital. In other words, the model is much too simple. It is a natural enough idea: to explain what might be currently going on, you need a more complex model that includes everything that could be important. There is certainly a place for this kind of more elaborate model. Christiano, Eichenbaum and Trabandt in this paper want to argue that a model based on New Keynesian theory can track what has happened over the last ten years. Their model has 40 equations. If I was trying to do a similar exercise, I would want to augment the standard New Keynesian framework with at least the following: nominal wage stickiness as well as price stickiness, a financial sector that endogenised both the cost and rationing of credit, a model of consumption which allowed for credit constraints and precautionary saving, a housing market, a model of the labour market that combined matching with rationing (as here), and something that allowed recessions to have long lasting (hysteretic) impacts on labour supply and technical progress. However large models like this will involve many macroeconomic ‘mechanisms’, and it will generally be unclear which mechanisms are important at driving particular results or explaining particular facts. We do not want to treat the elaborate model as a black box, but instead we want to understand its properties. To understand complex models, we need much simpler models. (I once - in this paper - called the process of relating complex models to simpler models ‘theoretical deconstruction’.) In fact it is often sensible to start with the simpler model. For example, a particular issue with secular stagnation is to show how the natural real interest rate can be negative for decades rather than years (i.e. beyond the Keynesian short term)? What mechanism can do this? As I explained in my post, neither a standard representative agent model nor a standard two period overlapping generations model (OLG model, where the two generations are those earning and those retired) will give you that result. What Eggertsson and Mehrotra show is that a very simple three period OLG model (which adds a young generation that borrows) where borrowing by the young is constrained (they would like to borrow more but cannot) can provide just that mechanism. That is a key point of the paper. The paper is not designed to explain where borrowing constraints come from: there is now a big literature on that. Thankfully the authors do not feel compelled to microfound these constraints. Instead the paper simply offers and explores a mechanism whereby an increase in these borrowing constraints could move the natural interest rate into negative territory, and for it to stay there. Having established that result, it is for subsequent work (which the authors intend to do) to see if that mechanism survives complicating the model, by for example adding investment. Suppose the endeavour is successful, and a more complex but realistic model is able to provide an account of secular stagnation that includes other important mechanisms and which is based on a realistic set of parameter values. That would be a success, but those not familiar with all the work would ask: why does this model allow real interest rates to be negative when the standard models we know do not. The reply would be that the three period OLG structure was critical, and to see why have a look at the original, simple model. Now you might say the authors should wait until they have built the more realistic model before creating what could turn out to be a research path that might fail to achieve its goal. That would be quite wrong, because the more debate there is within the academic community when ideas are at their early stages the better. I want to give an example of this, but here I will go into territory that will probably only interest macroeconomists. It might be the case, for example, that the authors intuition that their results will survive introducing other assets like physical capital can be shown to be wrong very quickly. Indeed, Nick Rowe has already made such a claim, arguing that the presence of land as an asset ensures a positive real interest rate. If Nick was right this could be enough to kill the research programme, without any more time being wasted. Whether he is right is another matter: this paper by Rhee may be relevant in that respect. Here I just want to add a final thought. Within an OLG framework, it may not be necessary to establish the existence of a steady state with negative real interest rates. The typical period in an OLG model lasts two or more decades. So if the dynamics of such a model involved some overshooting, it might be possible to generate prolonged periods (in years) of negative interest rates even if the steady state real interest rate was positive. To be honest I’m not sure what might give rise to overshooting of this kind, but that may just reflect my inadequate imagination. Ask most people if they think a particular tax - like fuel duty - should be reduced, and they will say yes. If you ask people do you think income taxes should be raised to pay for a cut in fuel duty, you will get a rather different response. So just asking people if they would like one particular tax to be cut without saying how it will be paid for is pretty meaningless. Unless of course your aim is to provide ‘evidence’ that taxes are too high, and you are not too worried about the nature of that evidence. There is a slightly more sophisticated version of this trick, and the UK Treasury have just played it. Each individual tax potentially distorts the pattern of economic activity. If that pattern without any taxes is near some ideal, then we can call taxes ‘distortionary’. If we taxed apples and used this money to subsidise the production of pears, people would eat too many pears and not enough apples. However there is one tax that is not distortionary, because it does not influence incentives and therefore this pattern of economic activity. It is a poll tax - a tax levied on each individual independent of their income, wealth or what they spend their money on. Economists call this a lump sum tax. So cutting any distortionary tax, and paying for this by raising a poll tax, is bound to produce beneficial results in terms of reducing distortions. So what could have been the beginning of an intelligent discussion of the costs and benefits of particular taxes (as in the Mirrlees review, for example) has been turned into a simple propaganda exercise. So what the Treasury have done is modelled all the benefits of cutting the tax, but ignored all the costs. If this was but one stage in a process that would subsequently look at the cost of these externalities, and would realistically model how these tax cuts were paid for, fine. As a stand alone exercise, I’m afraid the Treasury study is worthless. As Chris Giles notes in an excellent report, this is really part of a political exercise to build the case for tax cuts. It has two unfortunate side effects. First, it just encourages the suspicion among many that anything coming out of the UK Treasury at the moment is worthless propaganda. Second, it encourages those on the left who think that mainstream economics is inherently biased. But if you saw an opinion poll that asked people if they thought a particular tax was too high, without also asking what tax they would increase to balance the books, you would not say that this shows opinion polls are inherently biased. Instead you would just conclude that the person commissioning the poll had a political agenda. You might also ask whether the polling company should have accepted the commission. In an earlier post I sketched out what I thought would be the essential macroeconomic battleground for the forthcoming (2015) general election. ● The Conservatives would lead on austerity and growth. In May 2012 I suggested the line: “Austerity laid the foundation for our current growth, so we need to stick with it to ensure growth continues”, and the Chancellor has certainly followed my advice! Having linked austerity and growth, the Conservatives will go on to claim that only they can be trusted to deliver more austerity, and therefore continued growth. ● Labour, on the other hand, will lead on how living standards have stagnated over the last five years, which current growth is unlikely to change before the election. 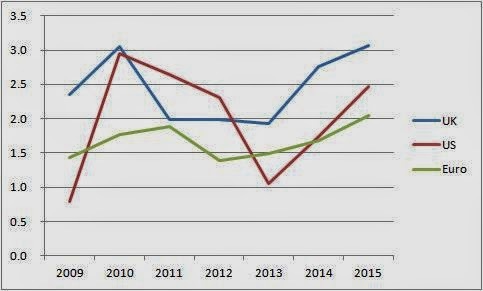 Having offered the Chancellor some spin in May 2012, in that post I thought it was only fair to offer something to the opposition, which was this chart. This is all nonsense of course. Osborne’s claim is Orwellian: austerity was not necessary for achieving growth, but actually delayed it. In Labour’s case we have no idea what lies behind the productivity collapse which is the main factor behind the chart above, so ascribing it all to government policy is a bit heroic. Having said that, the more the Chancellor tries to claim credit for employment growth, the more he opens the government up to the idea that they are responsible for the decline in living standards. For those who are tired of this focus on traditional macroeconomics, there may be some better news. One additional element in the battleground to come might be the issue of inequality, but only if Labour chooses to fight on this ground. The reason is that the Conservatives have signalled that they will reprise their ambition to raise the exemption threshold for inheritance tax from £325,000 up to £1m. President Obama has said that inequality is the “defining challenge of our time”. Thomas Piketty's “Capital in the Twenty-first Century” emphasises the importance that concentrated wealth is likely to play in increasing this inequality if it is allowed to be transmitted across generations. Inheritance taxes are clearly central to all that. So the Conservative proposal to raise the inheritance tax threshold is in effect saying that they do not regard increasing inequality as a problem. Will Labour respond by raising the issue of inequality? They have been reluctant to do this in the past, which seems paradoxical. One of the reasons for this paradox that I speculated on here was a view that to be elected Labour has to have some backing from the business sector. This position was recently outlined by Alan Milburn (former Labour cabinet minister) in this FT article. “Labour cannot afford a rerun of the 2010 election campaign, when not a single major corporation was prepared to endorse it. Overcoming that …. will need Labour to embrace a more avowedly pro-business agenda and match it with a more overtly pro-business tone.” He goes on: “Being a “One Nation” party means governing in the interests of all sections of society, better and worse-off alike. Reintroducing a 50p higher income tax rate does not match that objective.” There we have Labour’s dilemma in a nutshell. Taking action to reduce inequality is seen as anti-business, and it is argued that Labour cannot win without some business sector support. So I read with interest a piece by Ed Balls in the Guardian today. There he majors on the cost of living, but there is just a hint of something more: “the ongoing cost of living crisis is deeper and broader than one or two sets of figures. It's about whether most people on middle and lower incomes see their real earnings grow in line with the growth in the economy.” But inequality is not mentioned once, and fairness is only mentioned in the context of “balancing the books”. They make a number of important points. Even if thresholds remain unchanged, and despite high house prices, the OBR estimate that just 10% of estates will be liable to pay any tax at all. Implementing the £1 million threshold would cost the Treasury more than £3bn, which in times of austerity is money that could be better used elsewhere. And finally they say that redistribution is vital if inequality is not to be exacerbated. When the FT starts worrying about inequality, perhaps this is after all a battle that Labour can win. There has been some comment on the decision of the US central bank (the Fed) to publish its main econometric model in full. In terms of openness I agree with Tony Yates that this is a great move, and that the Bank of England should follow. The Bank publishes some details of its model (somewhat belatedly, as I noted here), but as Tony argues this falls some way short of what is now provided by the Fed. However I think Noah Smith makes the most interesting point: unlike the Bank's model, the model published by the Fed is not a DSGE model. Instead, it is what is often called a Structural Econometric Model (SEM): a pretty ad hoc mixture of theory and econometric estimation that would not please either a macro theorist or a time series econometrician. As Noah notes, they use this model for forecasting and policy analysis. Noah speculates that the Fed’s move to publish a model of this kind indicates that they are perhaps less embarrassed about using a SEM than they once were. I’ve no idea if this is true, but for most academic macroeconomists it raises a puzzling question - why are they still using this type of model? If the Bank of England can use a DSGE model as their core model, why doesn’t the Fed? I have discussed the question of what type of model a central bank should use before. In addition, I have written many posts (most recently here) advocating the advantages of augmenting DSGE models and VARs with this kind of middle way approach. For various reasons, this middle way approach will be particularly attractive to a policy making organisation like a central bank, but I also think that a SEM can play a role in academic analysis. For the moment, though, let me just focus on policy analysis by policy makers. Consider a particular question: what is the impact of a temporary cut in income taxes? What kind of methods should an economist employ to answer this question? We could estimate reduced forms/VARs relating variables of interest (output, inflation etc) to changes in income taxes in the past. However there are serious problems with this approach. The most obvious is that the impact of past changes in taxes will depend on the reaction of monetary policy at the time, and whether monetary policy will act in a similar way today. Results will also depend on how permanent past changes in taxes were expected to be. I would not want to suggest that these issues make reduced form estimation a waste of time, but they do indicate how difficult it will be to get a good answer using this approach. Similar problems arise if we relate growth to debt, money to prices (a personal reflection here) and so on. Macro reduced form analysis relating policy variables to outcomes is very fragile. An alternative would be for the economist to build a DSGE model, and simulate that. This has a number of advantages over the reduced form estimation approach. The nature of the experiment can be precisely controlled: the fact that the tax cut is temporary, how it is financed, what monetary policy is doing etc. But any answer is only going to be as good as the model used to obtain it. A prerequisite for a DSGE model is that all relationships have to be microfounded in an internally consistent way, and there should be nothing ad hoc in the model. In practice that can preclude including things that we suspect are important, but that we do not know exactly how to model in a microfounded manner. We model what we can microfound, not what we can see. A specific example that is likely to be critical to the impact of a temporary income tax cut is how the consumption function treats income discounting. If future income is discounted at the rate of interest, we get Ricardian Equivalence. Yet this same theory tells us that the marginal propensity to consume (mpc) out of windfall gains in income is very small, and yet there is a great deal of evidence to suggest the mpc lies somewhere around a third or more. (Here is a post discussing one study from today’s Mark Thoma links.) DSGE models can try and capture this by assuming a proportion of ‘income constrained’ consumers, but is that all that is going on? Another explanation is that unconstrained consumers discount future labour income at a much greater rate than the rate of interest. This could be because of income uncertainty and precautionary savings, but these are difficult to microfound, so DSGE models typically ignore this. The Fed model does not. To quote: “future labor and transfer income is discounted at a rate substantially higher than the discount rate on future income from non-human wealth, reflecting uninsurable individual income risk.” My own SEM that I built 20+ years ago, Compact, did something similar. My colleague, John Muellbauer, has persistently pursued estimating consumption functions that use an eclectic mix of data and theory, and as a result has been incorporating the impact of financial frictions in his work long before it became fashionable. So I suspect the Fed uses a SEM rather than a DSGE model not because they are old fashioned and out of date, but because they find it more useful. (Actually this is a little more than a suspicion.) Now that does not mean that academics should be using models of this type, but it should at least give pause to those academics who continue to suggest that SEMs are a thing of the past. For macroeconomists. This post is a kind of introduction to the new paper on secular stagnation by Eggertsson and Mehrotra. As usual, any misinterpretations are my fault. Note that a fall in n will reduce the real interest rate, which is a useful result if we want to relate secular stagnation to falling population growth, but rates cannot fall below the rate of time preference. Now if d is small, j could be less than one, which reduces the sensitivity of interest rates to population growth, although a fall in population growth still reduces rates. However this also means that the gross interest rate (1+r) could be less than one, so the steady state real interest rate could be negative. The middle aged need to save for retirement, but the only way they can do this is by lending to the young. The higher the real interest rate, the less the young can borrow because of the credit friction. In that situation, the real interest rate could easily be negative, because only then will the young be able to borrow enough to allow the middle age to consumption smooth when they retire. The key result that Eggertsson and Mehrotra explore is that a credit crunch - a fall in D - could lower real interest rates into negative territory, and could therefore generate secular stagnation. They consider how inequality could be incorporated into the model, and then embed the model in a nominal framework. Nominal wage rigidity is added (using a similar mechanism to that in the Schmitt-Grohe and Uribe paper I discussed here), and the implications for monetary and fiscal policy explored. So I have only touched on the paper here, but as this three period OLG set-up is not standard I thought this post might be useful. If a bank is too important to fail (TITF), it in effect gets a subsidy from the public. That subsidy is like an insurance contract for those who lend to these banks: if the bank looks like it will fail, it will be bailed out by the government and depositors will get their money back. This in turn means that TITF banks can borrow more cheaply, so they get the benefit of this subsidy every year. TITF banks could do various things with this subsidy: they could make their loans to firms or consumers cheaper (thereby undercutting competition from smaller banks), they could make higher profits that go to either shareholders or as bonuses to bankers themselves, or they could take excessive risks. They will probably do some combination of all of them. In 2009 the Bank of England calculated the value of this subsidy at £109 billion: that is about £1750 for each person in the UK. The TITF banks of course dispute this figure. (Donald MacKenzie has a very readable account of one example in the London Review of Books.) A week ago the IMF published their own study (pdf), using two different market based methods to measure this subsidy. (The IMF chapter is very readable, but Simon Johnson also has a good summary here.) This is a very imprecise science, but the IMF confirm that subsidies to TIMF banks are very large, although the £109 billion figure quoted above is probably at the upper end of the range of estimates (as the Bank also acknowledged in a later study). However, if we described this number as each member of the public’s contribution to help pay bankers bonuses (which it could well be), I think everyone would agree even a more modest figure is unacceptable. There are two particularly interesting features of the IMF analysis: it calculates numbers across countries and across time. On the first, some might have assumed that TITF subsidies would be largest in the US, but this is not the case. In dollar terms subsidies in the UK and Japan are of a similar size to the US, and of course the UK is a smaller country, so per capita subsidies are larger in the UK. In dollar terms subsidies appear largest in the Euro area. The IMF also calculate subsidies before the crisis (2006-7), during the crisis (2008-10) and after the crisis (2011-12). The worrying aspect of these calculations is that the subsidies do not seem to have fallen substantially in the post crisis period compared to pre-crisis. Worrying, but hardly surprising. In principle the TITF problem is fairly easy to solve: as Admati and Hellwig convincingly argue the proportion of the bank’s balance sheet that is backed by equity should be much much higher. (In simple terms, if a bank gets into trouble there are many more shareholders able to absorb losses before a government bailout is required.) The problem of TITF banks is political. As I discussed here, the lobbying power of the TITF banks is enormous. This is not just a matter of bribing campaign contributions to politicians. In the UK there is some evidence that the depth of the recession is partly down to lack of lending by banks, and the bank’s response to any proposals to tighten regulation is to imply that this will ‘force’ them to lend even less. If it is suggested that additional capital could come from reducing bank bonuses, they say all the talent will migrate to overseas banks. Quite simply, the TITF banks have immense power. Until the political will to take on the banks is found, we will each continue to subsidise bank bonuses. Postscript: for more, see this discussion via Mark Thoma. Because the IMF study tracks estimates of the subsidy to TITF banks through time, it can look at how the subsidy changed when the Vickers report was published (Table 3.2 and Figure 3.8). Publication is associated with a significant fall in the subsidy, but it was not nearly enough to eliminate it.